# 1 Sensor – Both camera features same sensor size but Nikon DF comes with 16 Megapixel FX format sensor with a amazing ISO range of 50 – 204,800 – on the other hand Nikon D800 features 36 Megapixel resolution FX format sensor with a limited ISO range of 50-25600. 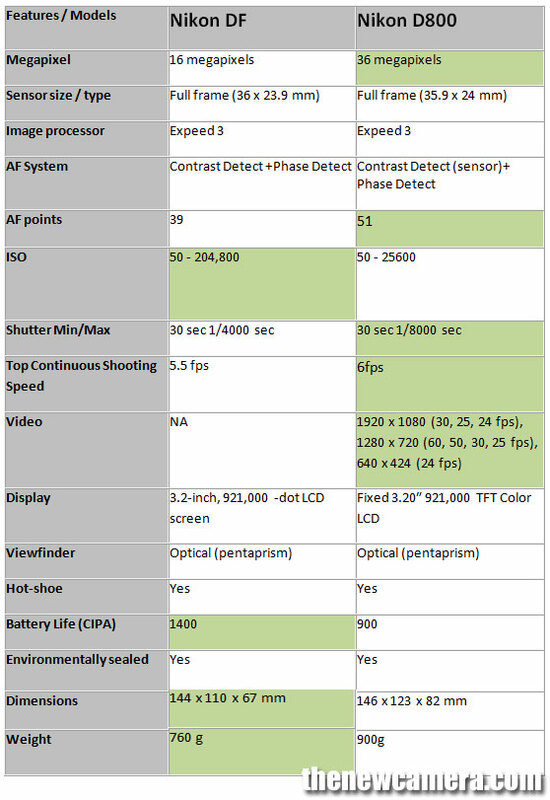 Nikon DF have large photodiodes compared to D800 and will perform better in low-light condition. # 2 AF System: Nikon DF features 39-Point and uses Multi-CAM 4800 AF Sensor on the other hand Nikon D800 comes with Advanced Multi-CAM 3500FX autofocus sensor with 51 AF points. It’s no doubt that Nikon D800 is offering advance AF system at the same price-point. #3 Shutter: You get bit better top continuous shooting speed with D800 (5.5 vs 6fps) and Nikon D800 also features better shutter range (1/4000 vs 1/8000). #4 No Video in DF: Nikon DF is a spartan still camera and it will not record video according to Nikon, Nikon D800 record Full HD video @ 30fps. Verdict: Nikon DF will give you cleaner RAW and JPEG files at High ISO, Nikon D800 gives you more resolution, advance AF system and Video modes. If you are a sill shooter only, I recommend you to buy Nikon DF DSLR. When it comes to the framerate you should mention, that the D800 shoots only 4fps in fullframe-mode and the 6fps are only possible with the optional grip. The Df offers 5.5fps in fullframeness.